Suitable for sensitive skin, NeutraLice Advance is one of a new generation of pesticide-free head lice treatments. NeutraLice Advance stuns the lice respiratory spiracles open and blocks them to physically prevent the louse breathing. The lice die from asphyxia and dehydration. They can then be easily removed as this breaks their grip on the hair shaft. Lice do not develop resistance as NeutraLice Advance has a physical mode of action. Does not cause stinging so is suitable for sensitive skin and children over 6 months of age. Developed by a pharmacist, the Nitcomb-M3 has three rows of teeth which are fine and extra fine. This patented three row technology comb increases the effectiveness you get with a single row comb. The outside rows of teeth glide through the hair removing larger head lice. 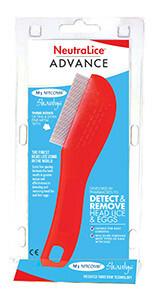 The extra fine row removes any smaller head lice, nits and eggs. Nitcomb-M3 is a class 1 medical device! NeutraLice Natural Spray solution contains a combination of tea tree oil and lavender oil (essential oils) which makes it pleasant smelling and ideal for children as well as the rest of the family. It works as a pesticide to kill the head lice and their eggs. NeutraLice Natural Spray is available in 200mL. The Natural Spray is ideal if you want the convenience of a spray application or to spray caps and other articles. NeutraLice Natural Spray is a registered complementary medicine. Warnings: NeutraLice Natural Spray: Not recommended for children under four years. For younger children speak to your pharmacist. For a low irritant treatment try NeutraLice Advance. Sometimes a warm, tingling or stinging sensation may develop during use. This is usually mild and resolves after rinsing hair. Discontinue use if severe irritation occurs. Keep out of eyes and ears, however if contact does occur, flush immediately with water. Seek advice from a health care professional if lice or more eggs appear after completing the third treatment. The removal of head lice eggs (nits) can be very difficult and frustrating as nits are attached to the hair with a glue-like substance. NeutraLice Conditioner Shampoo Lice Egg Remover is a specially formulated hair cleanser for daily use to help remove lice eggs (nits) and dead head lice. It can also be used after head lice treatments to help remove nits. It contains acetic acid, which can help break the bond between the nits and the hair. This helps loosen the nits, allowing them to be combed out without difficulty. Unless all the nits are removed there is a risk of re-infestation of head lice as the nits hatch between seven to 10 days. Conditioner Shampoo does not kill head lice.